OhMyVera! A blog about all things Vera Bradley: Road Trip Pictures! 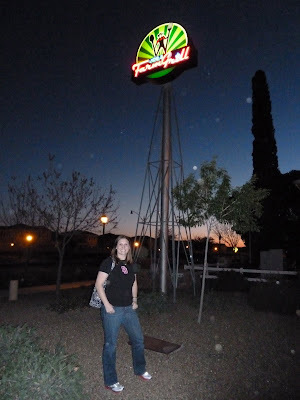 I thought that it would be fun to share a few of my road trip pictures! There isnt a lot of Vera, but they are fun pictures! We ate at mostly places from Diners, Drive ins and Dives and one from Man vs Food. Scroll down to be a part of my move from San Diego to DC. My last meal at an In N Out for a while. Cheeseburger with grilled onions, animal style fries and a pink lemonade. We stopped in Gilbert, AZ for dinner the same night as I had In N Out for lunch. Joe's Farm Grill was on DDD and they had great food! There is even a field next to the parking lot where they grow all of the vegetables that they use. I highly recommend it! In Amarillo, TX we stopped for the night. We headed to The Big Texan for dinner. They have a 70oz. steak challenge! There was a guy there trying to eat the 72oz steak with sides!!! Yikes! He didnt finish it though. Oklahoma City! We stopped at Nic's Grill. Pretty much the only thing on the menu is a cheeseburger and fries. He also has a daily special, but we both knew that we wanted the burger. It was sooooo yummy. I tried to pick mine up and eat it...it was a huge mess. Amber ate hers with a fork. That was probably the way to go. We blew through Tennessee pretty quickly, but we did stop in Nashville to eat at Neely's Bar-B-Que. I am so glad that we stopped there! I had a pulled pork sandwich and Amber had the ribs. I LOVED my sandwich! 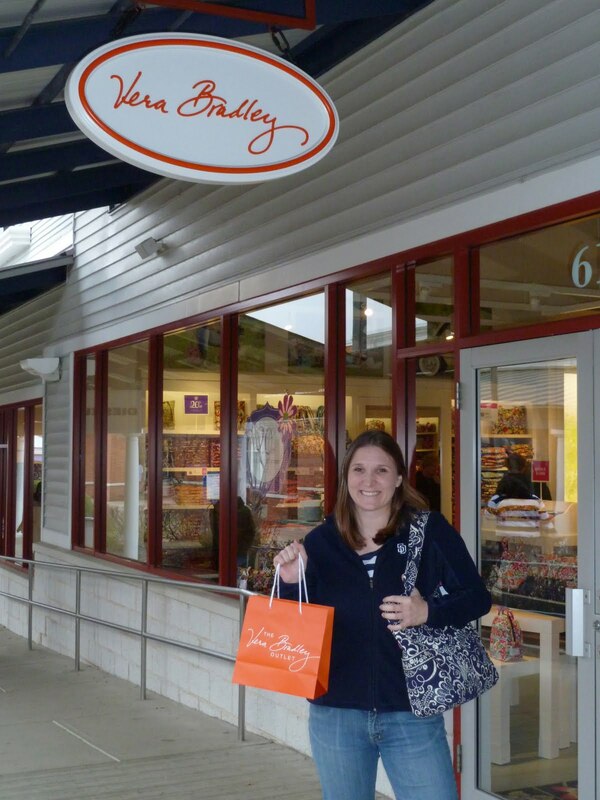 And of course we had to stop at the Vera Bradley Outlet!!! I never thought that I would be able to visit a VB Outlet since I was in California. But now I live within an hour of one!!! Lucky me. Although, I will say that the women who work there are not as helpful as the ones at the Signature store! Two women were working and three were standing around gossiping!! We are 99% sure one was a manager! I was shocked. They just seemed sooo lazy. I dont know how often I will be making the trip to the outlet store in Leesburg, VA.
As you can see my Twirly Birds Navy Pleated Tote made the trip with me! It was perfect for toting around all the stuff I had with me all week. Neely's BBQ! Lucky! I love their TV show and I have one of their cookbooks. Glad to see you made it to the East coast in one piece! Alison, now that I know you're the kinda gal who stops at DDD features I like you even more:) We like to do that kind of thing on driving trips too, although one of our best stops was at some places Rachel Ray featured in AZ around the Grand Canyon. I've been past the Big Texan several times but sadly never around a meal time, I had hoped we'd get to stop there one of our trips before moving back to MI. You're pictures at In and Out gave me cravings, I love that place! Glad you made your trips so much fun! Stop in the Columbia, Maryland store at the Mall in Columbia!!! We would love to meet you as we all follow your blog! :) Hope you like living in DC. @Katie - It was such a fun trip. The places had great food and it was really fun to see the places in person. And I am going to have to find something to take the place of In n Out. @Anna - I actually might come by this weekend! I need to exchange a Simply Violet Angle Tote that I have never used. I need to get something that i will use. I just have to to figure out which store is closer, but now that I have an invite to the Columbia store, I might just head there! Maybe see you guys on Sunday! Oh Anna! YOu beat me to it! You must come visit us at the VB store in the Columbia Mall! 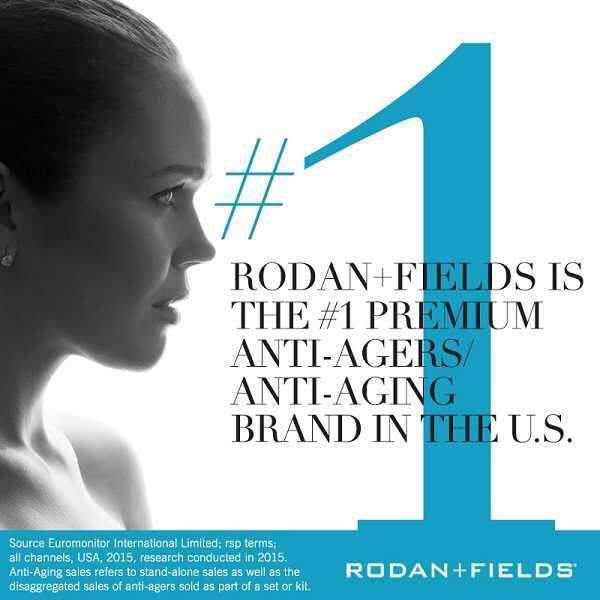 Anna and I both work there and we would love to meet you! I hope I'm working when you stop in! Alison, Glad to hear you had a fun trip driving cross-country. You should try Five Guys Burgers, tons of locations in the DC area - yum! I live about 40 minutes away from the VB Outlet in Leesburg. They do have way too many employees there, although most of them are super nice and helpful. Once in a while you will find a manager having a "sales" meeting right on the sales floor with a few of them, which seems strange. Other than that, most of the sales girls are almost too helpful! Lots of new releases today! Vera Bradley Summer 2011 Frill! Old Colors in New Styles!